A while ago I put together a couple of ideas for ELH Challenge 118: Creating Labeled Graphic Interactions for E-Learning. You can see the end result here (note that this has not been optimised for HTML5). Funnily enough, Lisa Walker had exactly the same idea - it is almost scary how similar our approaches are! Oh, and do I need to say that I really like Lisa's design? The difference, however, is that my assets were created in the Storyline 2, even the tiny badge. This took some effort but as a result I could easily change object states without GIMP/Photoshop magic. Perfect for workplaces where you don't have either permissions to install any open-source software or budget for the paid alternatives (trust me, I've been there). 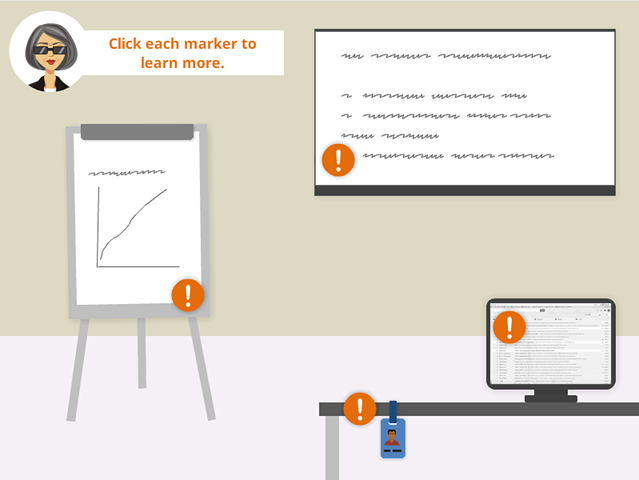 You'll also notice that all four objects (whiteboard, flipchart, etc.) change into "safe" states once the learner has reviewed the information. This creates a visually impactful statement of "securing the area". Want to see how the module and the images were made? Download the .story file here. Redacted font, if you wish to have the "squigglies" seen on the whiteboard. I used Redacted instead of a readable font as it made the screen less cluttered, meaning less cognitive load. For more ideas on creating images in Storyline 2, check out this ELH Challenge.